Books on healing are quite prolific, and cover a range of specialized healing modalities, and there are also a number of non-specific healing books as well. The book reviews on this page are for books that cover general principles of self healing. Reading about how to heal yourself is very valuable, as you can do this when you have no one else to help you. There are many books that are in-depth guides to particular types of healing, and if you are interested in a specific healing method these books will not be covering this subject. All of the following are books that will help you to get to a place where it is possible to move forward and both heal yourself, and then move on to healing others. There are many wonderful healing modalities yet general principles apply for self healing regardless of what healing type you wish to do. If you are already a healer some of these books will probably be in your home as many of these are the basis for many of you when you begin to investigate self healing modalities. 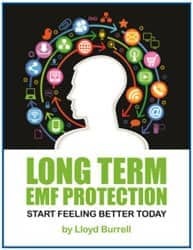 Long Term EMF Protection... Start Feeling Better Today is written by Lloyd Burrell. Are you electrically sensitive and looking for ideas on how to deal with the effects of electromagnetic radiation? This book is very supportive, because it is written by a quite knowledgeable man who has been researching this subject for years. This helpful resource is written by a man who has electrical sensitivity so he personally knows about what it is like to have this problem. Lloyd makes no outrageous claims in his books and he lets you know there is no magic bullet, just practical advice. I truly appreciated Lloyd's information when I needed it, and am very happy to see his work published in this helpful book. It is definitely worth owning a copy of this excellent book. In case you are wondering, I am also electrically sensitive, I became mildly sensitive to wi-fi emanations around 5 years ago, and strongly sensitive to all sorts of devices, including mobile phones and ipads around a year ago. I believe my sensitivity was elevated from the drugs I was given when I had surgery on my broken wrist, as they upset my body's normal functioning. You Can Heal Your Life is written by Louise Hay. Louise Hay has published a few different versions of this book, but this one is my favorite version, as it is just so beautiful. The pages are extremely colorful with beautiful pictures, like works of art. This makes it such a pleasure to just leaf through, when you simply want to read something nurturing, that gives you a lift. This is one of my favorite books on healing, as it contains an amazing amount of basic information on how to go about creating self healing. 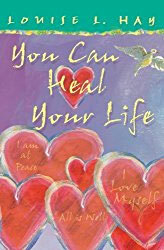 Hear of You Can Heal Your Life by Louise Hay? I use this book constantly as it is just such a pleasure to pick up, and has such a wealth of simple yet profound knowledge. My husband and myself own two copies of this lovely book, as we both use it such a lot. It has chapters explaining how your way of thinking creates different health problems and each chapter ends with a page of affirmations relating to the subject of the chapter. Towards the back of the book there is a table that lists health problems, with affirmations to say to lift you out of the negative thinking that may have been causing the issue. This is a gorgeous book and one that everyone might like to own. It does come in a less colorful version, that has the same information just without the bright pages. 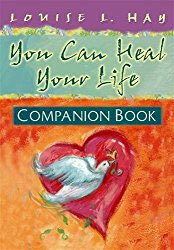 You Can Heal Your Life Companion Book is written by Louise Hay. The companion book to 'You Can heal Your Life' is really what other authors call a workbook. It contains lots of exercises around issues that are covered in the first book. Again it is a very beautiful book and one that helps you to take the action required to move you to a new place. It covers basic beliefs and helps you to move out of negative thinking and embrace positive beliefs. I include this in the books on healing as it certainly aids you in healing issues that may be the root cause of disease that you have manifested in your body. While it is a companion to the original book, it also stands alone and contains many affirmations and suggestions for changing negative ways of thinking, that flows through to an improvement in your health. 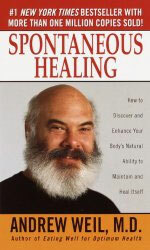 Spontaneous Healing is written by Andrew Weil. In this book Andrew Weil discusses the role of western medicine and its inability to allow the body to heal itself. He talks about various cases where so-called spontaneous healing have taken place that may seem to be miracles. He talks about case histories of clients and how they were able to be healed of problems where doctors felt there was no hope. Andrew Weil has written a series of books on healing, and they cover his 8 week program to optimum health, aging, natural health and eating well. I found this an interesting book which encourages you to make better choices when you are faced with serious health problems. 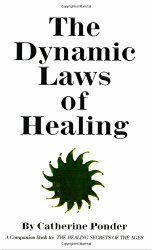 The Dynamic Laws Of Healing is written by Catherine Ponder. Catherine Ponder outlines in this book how you can utilize the spiritual laws of healing to use the healing power you have within you to heal yourself. She explains how it is that sometimes those of us who have so-called incurable diseases can be healed in what may be felt to be miraculous circumstances. Yet she explains that it is not a miracle but the simple act of utilizing what each of us has within. This is one of the classic books on healing and has been around for a very long time. Catherine Ponder has written a series of books on using the power of Spirit to create amazing transformations in your health and well-being. She explains how this can be done, simply and clearly, and it is easy to put into action. 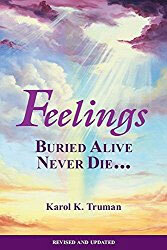 Feelings Buried Alive Never Die is written by Karol K Truman. This Book actually helps you to discover why as the title says, 'Feelings Buried Alive Never Die'. Karol Truman explains where it all started and helps you to understand the result of buried feelings on your health and well-being. This is one of the books on healing that aids you right from the beginning of the book to understand how to take action to heal yourself. As you let go of negative feelings, and as you resolve the issues you will embrace the better feelings that you are free to choose. Chapter 17 is particularly helpful, as it has a long list of feelings... and next to them their opposite, which is very helpful. Karol's methods for resolving the negative feelings are simple and easy to carry out, and can create profound change in your life. I love this book, and use it in conjunction with EFT or meridian tapping, as it has a list of issues in it, that help you to work out what to tap on. 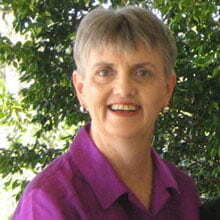 Hands Of Light and Light Emerging are written by Barbara Brennan. These books are beautifully written, and have good descriptions that explain in detail about hands on healing, and energy work. It has a lot of information on the chakras, and your auric field and the relationship between the health of the energy fields of the body, and your health. It gives guidelines on how this can be used for healing. 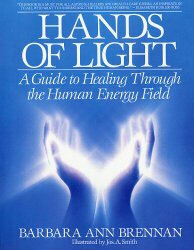 This is a book that numbers among the top books on healing, and all healers should read it. It gives you a deeper understanding of many issues related to healing and the etheric body. Barbara is herself a gifted healer and has been doing this type of healing for over 25 years, and her book is known as a classic text in this field. Well worth reading. 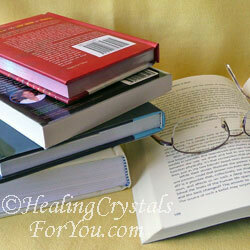 The books on healing that I have reviewed above are only a few of the many books available on healing. I chose not to cover any books on specific healing modalities, such as Reiki, as I may cover this on individual pages later on. All of the books reviewed were books that have been beneficial to read, as they allow you to take responsibility for your own healing, instead of relying on others to heal you. "It is what you read when you don't have to, that determines what you will be when you can't help it." Oscar Wilde. Checkout this amazing crystal encyclopedia!